It might come as a shock, but just like in Iran and Saudi Arabia, the United States also has a version of “religious police” forces. They’re located in two towns on the Arizona/Utah border, where polygamy is common because of the locals’ religious beliefs. It’s kind of a “members only” deal, though. Non-believers—in this case, non-fundamentalist Mormons—have complained that not only do local cops routinely fail to help the non-believers, they actually target them for harassment. A judge has ruled that the local cops are acting outside the bounds of the U.S. Constitution and proceedings are scheduled for this fall to determine whether the agencies should be closed. This is, of course, why some people get nervous when law enforcement agencies start slapping “In God We Trust!” stickers on official vehicles. 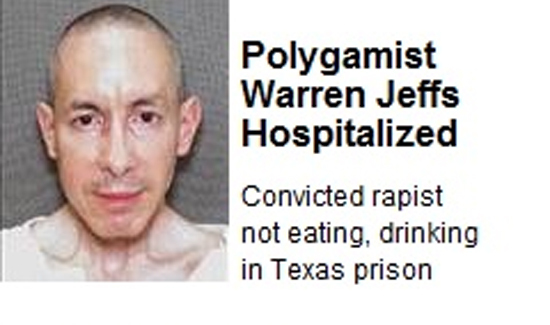 After all, some people worship gods named Warren Jeffs. Your comments referring to the fundamentalist lds church by lumping the TRUE Church of Jesus Christ of Latter-Day Saints is not only ignorant but exposes you as a bigot in every way. #1 the fundamentalist church does not in any way or form represent the LDS church of over 15 million members world wide. The TRUE LDS church does NOT practice polygamy. In fact in a decree to the world entitled “A Proclamation to the World” September 23, 1995 completely and utterly disavows ANY marriage not of One man and One woman. Secondly, in NEITHER the fundamentalist or TRUE LDS church has Joseph Smith ever been worshipped or referred as god or a god. He is simply regarded as a prophet not unlike Moses, Abraham, Isaiah, David, Elijah and so forth. Lastly, The TRUE Church of Jesus Christ of Latter-Day Saints do not refer to ourselves as “Mormons” except to enlighten the ignorant, like yourself, so we are.not confused with Quakers or Amish. I believe you and APB Magazine owe the LDS community at large and apology. I am a cop Washington state, a veteran of the United States Marine Corps, I have been married 25 years to my ONLY wife and I do not appreciate ignorant people that supposedly know what it is like to serve as LEO’s being ignorant, smug and foolish. My job as a follower of Christ is to forgive you for your transgression, so I do, but forgiveness does not equal condoning. Stay safe brother.